On Sunday we called in at Tanfield (a social call – not work! ), which was lightly dusted with snow. Sir Cecil Cochrane was working the passenger trains whilst Renishaw Ironworks No.6 was being steam tested. Below: Sir Cecil Cochrane takes water at Andrews House station. Below: Beamish’s NER coach parked in the carriage sheds at Marley Hill. 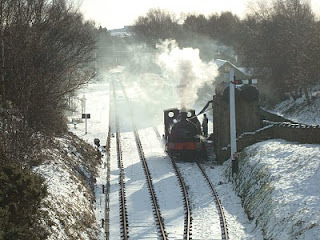 Below: Renishaw Ironworks No.6 outside Marley Hill engine shed during its steam test. Preliminary discussions have taken place regarding Beamish hiring this locomotive to re-commence our passenger operations at Rowley Station this Easter. It is not dissimilar to the Hudswell Clarke engines used on the Easingwold Railway in North Yorkshire, so its appear acne wouldn’t be entirely without justification! ← News from around the site.